DaVinci Dental Method: The DaVinci dental method is an in-office dental procedure that is administered by a licensed dentist. Using the DaVinci LED blue laser light in combination with our proprietary blend of whitening gel to give the best in-office whitening results you can achieve. The DaVinci Professional method is a non-dental, self administered process that provides clients with professional guidance to safely guide them through the whitening process. 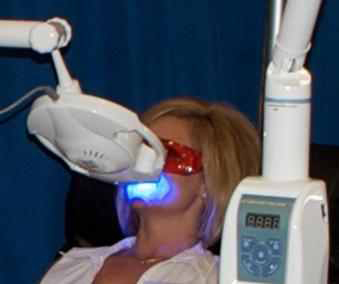 Using the DaVinci LED blue laser light in combination with our proprietary blend of whitening gel to give the best whitening results you can achieve. Our professional method is used by medical spas, Aesthetics and Wellness centers, Salons, and entrepreneur looking to start a teeth whitening business.